Why intersectional ideology undermines the legacy of Martin Luther King Jr. The alliance between African-Americans and Jews during the struggle for civil rights has often been invoked when tensions between the two communities have arisen in the decades since the 1960s. Yet the memory of blacks and Jews working together is important not so much for what a few heroes did a half-century ago, but because it sets an example to be emulated by subsequent generations. Since then, Jews and blacks have sometimes fallen out over issues like affirmative action. But the two communities have still generally found themselves on the same side of many, if not most, of the great issues of the day. However, intersectional ideology may succeed where others who sought to sow strife between blacks and Jews failed. That theory holds that the struggle for civil rights in this country is linked to the Palestinian war on Israel and has gained more notoriety in the last few years as it has been championed by leaders of the anti-Trump resistance. The attempt to tie civil rights, as well as the cause of equality for women, to both anti-Zionism and the BDS movement received a full airing at the various demonstrations organized by the Women’s March and related groups last weekend. Speeches and statements by March leaders Tamika Mallory and Linda Sarsour illustrated the way hate for the one Jewish state on the planet has become thoroughly integrated into the agenda of the left. Indeed, those themes were sounded even at events sponsored by groups that sought to disassociate themselves with the national group after it became tainted by anti-Semitism, as Rabbi Nicole Guzik of Sinai Temple noted when she explained why she walked out of the Los Angeles March. But even more disappointing is the attempt to use the annual Martin Luther King Jr. holiday to twist the great civil-rights leader’s legacy to put him on the side of BDS and the war on Israel. That was the conceit of a New York Times op-ed by columnist Michelle Alexander on Sunday in which she sought to claim that King would have joined the attack on Israel if he were alive today. 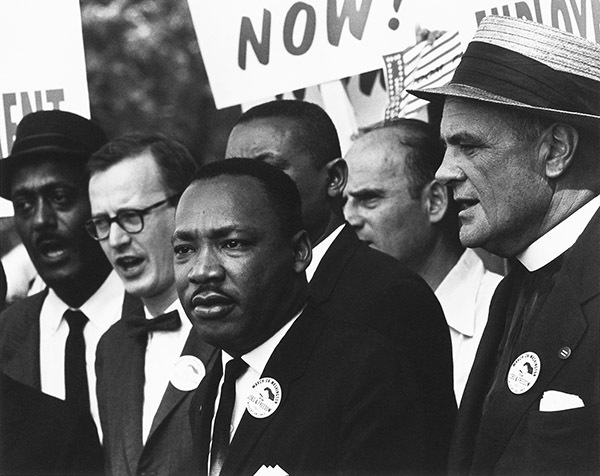 King was inexorably drawn to any fight against injustice. But the idea that he could have been convinced that the Jews – alone of all the peoples of the world – should be denied a state and rights that no one would think to deny anyone else requires not merely a suspension of disbelief, but a deliberate attempt to deny things that he actually said and believed. But as Alexander’s article illustrates, those who seek to reimagine King as an enemy of Zionism, rather than as its friend and advocate, are not deterred by the facts. In its depiction of the conflict between Israel and the Palestinians, Alexander’s article is a compendium of half-truths and outright lies. The struggle between the two sides is a complex one in which both sides of suffered, but in Alexander’s cartoonish version, only the Palestinians have rights. That the Palestinians have repeatedly refused offers of peace, including statehood, is never mentioned. Nor does she (or her editors) think it necessary to detail that the Israeli security measures she laments were rendered essential by terrorism. But her column is not about ending the Israeli “occupation” of the West Bank or Jewish settlements. To the contrary, her beef is with Israel’s existence as a Jewish state in the pre-1967 borders. Her support for BDS is rooted in the same conviction that motivates its other supporters: a false vision of Israel as a colonial state and the imperative to eliminate it, rather than merely to place a Palestinian state alongside it. In her reading, Zionism, the national liberation movement of the Jewish people is, alone of all such ideas, illegitimate. So while Alexander pays lip service to concerns about anti-Semitism, she ignores the fact that a movement dedicated to destroying the sole Jewish state is by definition an expression of Jew-hatred. We don’t have to engage in counter-factual theorizing about what King would have done had he not been assassinated to understand that his faith in nonviolence and support for the rights of the Jewish people would have always placed him on the other side of the argument from an advocate of violence like Davis and BDS supporters who wish to wipe Israel off the map. A lot has changed since King was murdered in 1968 – a point in time when it would have been unimaginable for the Times to publish a screed calling for Israel’s destruction. That it thinks it appropriate to attack Jewish rights on a day dedicated to commemorating the struggle for civil rights for all people is a bitter irony that a man like Martin Luther King Jr. would have viewed as a betrayal of the legacy of brotherhood for which he gave his life. Jonathan S. Tobin is editor in chief of JNS.org.